Welcome to our Term 1 update. Term 1 is well under way, and our team is hard at work across a range of domains. The bulk of our updates for Core Generic, ECE, Legal Studies and English for Academic Purposes are available for use. We continue to work on our Computing, Business Admin, Digital Technologies and English language assessment resources. We will be updating our Retail and 266 series (literacy and numeracy) resources this year and starting development of Business Studies resources and new English Language teacher guides. We are sad to say goodbye to Dustin Bisschoff, who has worked with us in the northern region for many years, and we wish him all the very best for the future. Our team is excited to introduce Lana-Dee Paul, our new Northern Sales Consultant. If you have any queries about our new resources, or your current library of resources, please make contact with Lana-Dee, she is more than willing to assist you. We’re publishing the last of our 48 updated core generic standards over the coming weeks. These units relate to employability, life, and industry skills, and form part of our Work Ready Solutions which are popular in Gateway programmes. Click here for the 2018/19 Brochure. In addition, our writers will be updating our existing retail resources to the latest versions of the standards. The majority of Level 2 ECE resources are now available, and the remaining Level 2 resources will be completed during term 1. The next unit to have resources published will be 29859. This will be followed across term 1 by the three remaining Level 2 resources – 29858, 29860, and 29861. 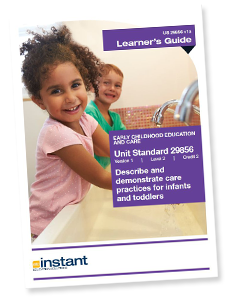 Instant is in the process of developing the complete range of Foundation, Level 1, and Level 2 English Language assessment materials. We have done extensive research with an education provider to develop assessments that are relevant and accessible to second language learners. Currently, all the listening and speaking assessments for Foundation, Level 1, and Level 2 have been completed. Reading and writing assessments are due to be completed by the end of Term 1. We also plan to develop a range of teacher resources, including learner worksheets, to help prepare learners for the assessment tasks. The full suite of materials for the most recent Level 2 and 3 Computing unit standards are now available. These units support programmes leading to the Level 3 NZ Certificate in Computing (Intermediate User), and the Level 2 Certificate in Computing (User Fundamentals). We are also currently updating our existing materials for Level 2 and Level 3 programming – written for use with Python. See our catalogue for the full list of Level 2 and 3 Computing materials now available. Materials for the first of the 15 credit Business Administration standards (29024 - Provide business administration support using business technology) are currently available. These standards have been specifically developed for the Level 3 NZ Certificate in Business (Administration and Technology). The writers at Instant have been busy. All of these updates are available from within the Members Library. Otherwise they can be previewed and purchased through the website. To view full terms and conditions visit our website here.